Creating educational and vocational opportunities for all, including refugees from South Sudan, Somalia and Middle-Eastern countries such as Yemen, has been a tremendous challenge in Kenya. The United Nations Educational, Scientific and Cultural Organization (UNESCO) has been working to provide quality and inclusive education for vulnerable populations in the country, in collaboration with the Government, the UN Refugee Agency (UNHCR), and UN Children's Fund (UNICEF). Asako Ikegami (Japan) serves as a UN Volunteer Education Project Officer with UNESCO under the Human Resource Development Programme for Peacebuilding and Development. Here, she visits internally displaced persons in the Baringo County, Kenya. UNESCO’s Global Citizenship Education (GCED) works to instil in learners of all ages the values, attitudes and behaviours that support responsible global citizenship: creativity, innovation and commitment to peace, human rights and sustainable development. Combined with Education for Sustainable Development (ESD) these interdisciplinary learning methodologies are integral to the achievement of Sustainable Development Goal 4 Goal (SDG4) which seeks to promote equality and inclusive education for all. Asako Ikegami (Japan) serves as a UN Volunteer Education Project Officer with UNESCO in Kenya under the Human Resource Development Programme for Peacebuilding and Development. 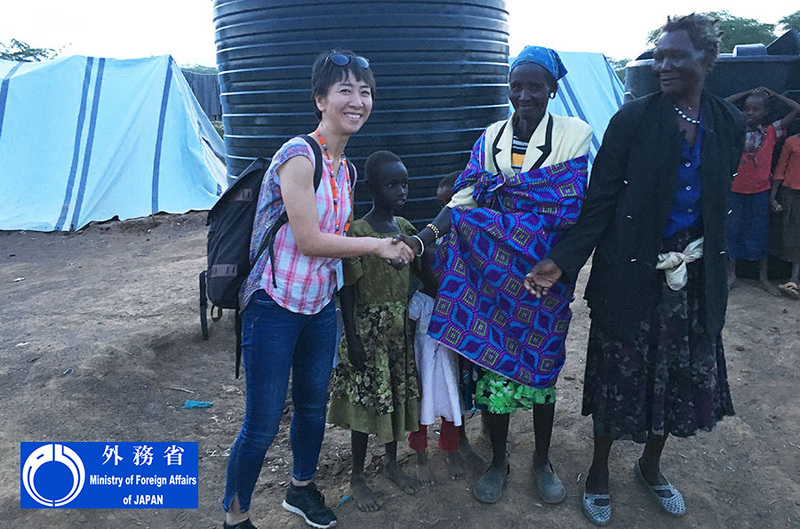 Placed with UNESCO, HRD-UN Volunteer Asako Ikegami spent a year in Kenya contributing to the ESD and GCED programmes and provided support to the humanitarian/development nexus through collaboration with UNICEF, UNHCR and the UN Population Fund (UNFPA). Asako was also involved in a project looking at the provision of inclusive education for children with disabilities in Kenya and supported the coordination of the African continental forum on ESD. Asako undertook a range of activities related to the advancement of educational outcomes under the direct supervision of the Programme Specialist in Education Coordination in the UNESCO Regional Office for Eastern Africa. She supported the incorporation of curriculum/education systems in relation to ESD through the ASPnet school networks in East Africa. She was also engaged in designing and developing various projects in collaboration with UNESCO clubs, youth and community organizations focusing on education-related issues to create sustainable and inclusive educational systems. Asako also participated in media outreach, public relations, and strategic communication initiatives to increase visibility of the education programmes and the UNESCO Regional Office. In coordinating the African Continental Forum on ESD, Asako helped over 50 African countries to unpack the sustainable development goals (SDGs) and identify national opportunities for reform. Over 200 counterparts in the education field participated and discussed how to integrate SDG4 contexts into their national education systems. Of this experience, Asako said, "this activity generated significant changes with regard to education systems and policies in the participating countries. This allowed governments to implement reform along with emerging challenges such as refugee influx, climate change and infectious diseases". A key insight Asako gained during her time with UNESCO was the importance of considering the entire political landscape of partner countries, namely health, education and economic development. The ability to manage a wide range of partners and foster strong and inclusive relationships was central to Asako’s effectiveness during her assignment. In one project, she worked with UNICEF, UNFPA and Kenyan educational public/private organizations to plan a project proposal for supporting children with disabilities through ICT in secondary schools. Asako’s supervisor, Marina Patrier, complemented Asako on the depth and breadth of experience she gained in the 2030 Agenda, which has set her up well for future employment opportunities. "Asako had the opportunity to work with a wide range of partners, including UN agencies, donors and government counterparts. The work was strongly framed within the SDGs agenda which allowed her to learn a lot in this area and as a result, her new job now is focusing on SDGs," Ms Patrier said.